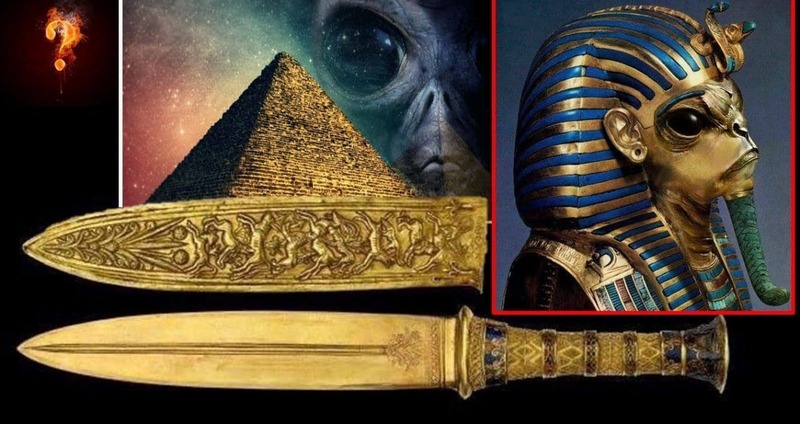 Home » Tutankhamen’s Dagger Was Made From “Alien Gold”? During the reign of King Tut between 1333 BC and 1324 BC, the understanding of iron metallurgy, or indeed the casting of such objects was very limited. Iron smelting is the extraction of usable metal from oxidized iron ores. It is vastly more difficult than smelting tin and copper, such metals could be cold-worked in simple pottery kilns and then cast into molds, a process largely accepted as being present within ancient Egyptian times. However, the smelting of iron requires hot-working, and can only be melted in specially designed extremely heated furnaces. It is therefore not surprising that humans only mastered iron smelting after several millennia of the bronze age. However, there is a pair of relics, found within ancient Egypt, whose sheer existence disprove the officially held, chronological account of when these hardened metals were developed.